There’s a saying that goes roughly, ‘You live more in 10 minutes on a motorcycle than you do in a lifetime spent at work.’ Steering a screaming BMW S1000RR into the first turn at Eastern Creek at something approaching 160kph, your life, no matter how long it is, will change forever. 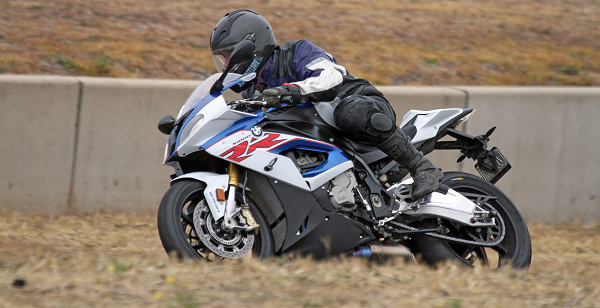 BMW’s RR Experience is a chance for punters to ride some of BMW’s high-performance machinery in its element. 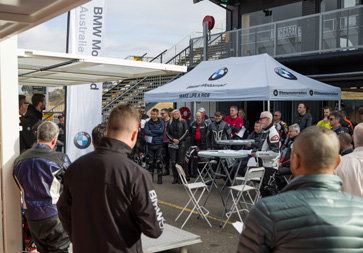 International-standard race tracks like Phillip Island in Victoria, Sydney Motor Sport Park – Eastern Creek – in NSW and Queensland Raceway are made available to potential BMW customers and current owners to push the performance envelope of a few seriously magnificent motorcycles. Owners can also bring their own bikes and go for a strop if they like. All brands are welcome. But the star of this big, glamorous, high-octane travelling show is the S1000RR. At around 200 horsepower and with a dry weight of just over 180kg, the bike is a lethal, sleek, race-ready missile. But thanks to BMW’s leading-edge engineering and electronics, the heart of the missile is a guidance system which lets it purr like kitten. Want to know we mean? Sign up for a BMW RR Experience. What Tradies Want was lucky enough to suit up and sample three different bikes during the RR Experience at Sydney Motor Sport Park, and as days at the office go, it couldn’t possibly be much better. After a briefing and being assigned to various bikes in various sessions, we climbed on board the most highly specced bike we’d ever been allowed to get close to…let alone ride. As the pit lights turned green we fired the S1000RR out onto the track and were taken as close to heaven as we’d ever been. Ride your own bike (any brand) – a ‘Track Day’. The latest incarnation of the S1000RR may well be the star of the show, but other BMW performance models are available as well. On our Experience the S1000R and S1000XR were also available for trial in a track environment. The beauty of that is, there’s no speed limits, no traffic, and a surface designed to allow high-performance machinery to run at the highest speeds possible, brake at the edge of the grave, and if you’re good enough, carry enough corner speed to slow down the rotation of the planet. Riders are able to get a true feeling of the braking performance, ease of riding and, in this case, BMW’s quick-shift pro system. The clutch less up and down shifts are definitely a great feature which not only make for a stress-free commute or weekend ride, but can make a big contribution to fast, smooth lap times. What Tradies Want kicked off on the S1000RR, and in case you haven’t already worked it out, we’re absolutely smitten. The bike is so impossibly smooth – in a riding sense – and so incredibly attuned to the rider’s input, it’s beyond us to describe. Brakes that seemed ridiculously powerful came into their own when the bike was let loose, and the ultra-smooth shifting allowed by the quick-shift mechanism and slipper clutch were sensational. 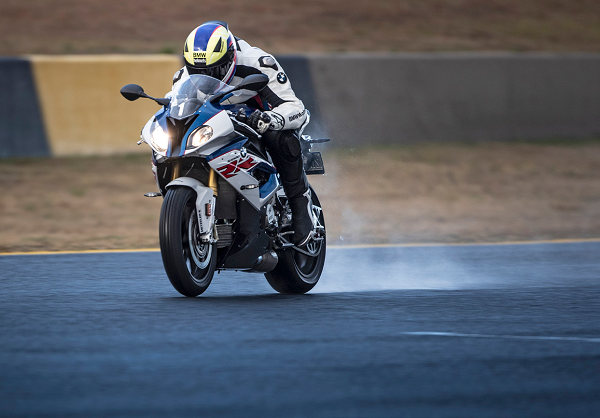 The S1000RR can be ridden deep in to corners at insane speeds and, even by riders with the What Tradies Want staffers’ negligible talent, fired through turns at ridiculous, heart-stopping speeds. The bike hardly dives under brakes, it sits rock-solid during deceleration, even on the edge of the tyre, and even with 199 horsepower let loose on the exit of a turn, all the drive gets to the tarmac without any squirming or fighting the ’bars whatsoever. We still can’t believe this bike is sitting on dealership floors for members of the public to enjoy. It’s one of the most incredible riding experiences we’ve ever had. After the mind-numbing precision of the S1000RR we swapped to the slightly less-aggressive S1000R. The ’bars are flatter and the cockpit position more open. The mechanical and electronics are close to the same, but without the scrunched up riding position and with engine tuning just a little less forceful than the RR, we were in our happy place before we’d even left pit lane. The S1000R has a stronger bottom-end than the RR, and it’s tuned for more torque. It still offers 165hp, so there’s plenty of latitude for a rider to be very aggressive on the 1000R, but there’s also room – both physically and performance-wise – to take things easier and cruise if that suits the mood. We didn’t do any cruising. We fell for this bike straight away and finally felt we were putting together whole smooth laps instead of just occasional sectors. Our final bike for the RR Experience ride was the S1000XR. With the same engine, gearbox and electronics as the S1000R, the XR is more of a dualsporter. The seating position is quite upright and the screen, rack and pannier frames show the bike is clearly meant for travelling in the everyday world, rather than circulating in the rarefied atmosphere of a world-class race track. Even so, 200kph and more were easy-peasy on the long, downhill main straight, and the bike was happy to reward aggressive cornering and braking with impressive performance. If we were looking for a bike to live with during the week and rule the world on weekends, the 1000XR would be it, no question about it. As the rain began to fall we took the safe option and headed to the cafeteria. The BMW guys and girls encouraged us to keep riding so we could enjoy how the on-bike systems tamed even the most unsuitable conditions, and we did for a while, but the thought we may deck one of the beautiful machines got the better of us. As we sat back and thought of all we’d experienced we knew we’d done something really special. It was one of those days we’ll look back on for the rest of our lives, reliving the feelings over and over again in our minds, breathless at the mind-blowing enormity of it all. We’re not special. Anyone can do it. You can do it. 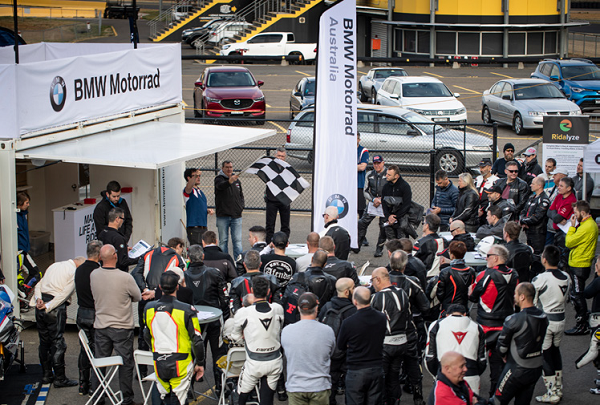 Log on to http://bmwmotorrad.com.au/ RRexperience and sign up. If you do, the chances are very, very high you’ll find us there again. Who Is The RR Experience For? The event is open to anyone with a full motorcycle license. The track-day format is friendly for first timers and for many it’s their first opportunity to ride their own BMW in a track-day setting. You don’t need track experience to participate in the Test Ride and Track Days. It doesn’t matter if you’ve done a track day before or not. If you’d like to experience your motorcycle’s performance in a controlled environment, this is for you. This year there were two graded groups to better cater to differing levels of experience. Lead and sweep riders are on track for the first two laps of all track-day sessions to instill confidence in first-time track riders. The lead and sweep riders are on the track for all test-ride sessions. Cam Donald (Isle of Man TT) and Aussie Superbike competitor Glenn Aller ton at tended the 2018 RR Experience in each State, and rode with customers throughout the day. 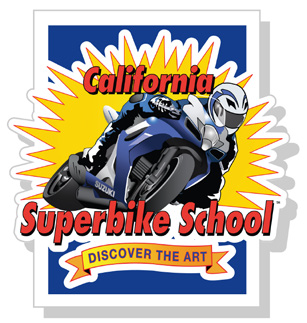 The involvement of the California Superbike School (CSS) means riders have access to some of Australia’s most experienced performance-riding coaches and it adds a huge dimension to the RR Experience. CSS has a wealth of knowledge and the track and riding advice makes for massive improvements in rider confidence. BMW Motor rad staff and dealers are on hand to provide information about BMW performance models and demonstrate different features of the bikes.